In 2007, I worked at the Berlin Mall Waldenbooks branch as a bookseller. In July of that year, we were able to take part in what was probably one of the biggest literary launches to date: the release of the final volume of Harry Potter, The Deathly Hollows, a highly anticipated book that had people lining up down the mall, and which saw an arrival of hundreds of sturdy white and red boxes with special tape to prevent theft or tampering. In my short time as a bookseller, I've never seen the same fervor or attention placed on a novel's release. My sister, dressed up as Luna Lovegood for the line, purchased our family's copy just after midnight, and returned home to start it. The next couple of days saw us stealing the book from one another, reading it chapter by chapter while we pretended to be ready to release spoilers for the parts that each other had yet to read. We both finished the book, and moved on to other things. With all of the books in hand, and needing to read something I didn't have to pay as much attention to, I reread the entire series in twenty days, or 3853 pages at just under 200 pages a day. It's a pace that I haven't read at for a long time, as the books that I pick up have changed and my education has brought my reading speed down. 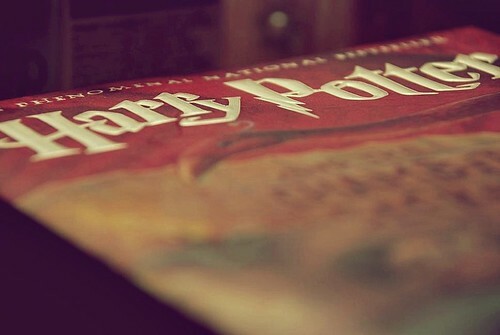 It was refreshing, exhilarating and fun and a good opportunity to pull in the entire Harry Potter story within a small amount of time. The Harry Potter books were something that I had picked up early in High School. Around 2001, the books had become incredibly popular, I found myself borrowing out the first two the day before a snow storm. With a snow day right after, I was angry: I'd read through both books, and had to wait for a full day to borrow out the latest book, the Prisoner of Azkaban, still one of my favorites. The fourth book came while I was working at Camp, and the fifth was snatched up by my sister while I went on a graduation trip with my classmates in 2003. Books Six and Seven came out while I was in college, and for the most part, were completely unmemorable. As I blew through the first four books in the series, I was reminded of why I loved these books so much as a high school student. Despite the drawbacks when it comes to the writing style (there's a reason why I can blow through each book quickly) and some of the more less-nuanced parts of the stories, Rowling has put together an incredible series, one that certainly appealed to my high school imagination, and its grown up counterpart. What struck me, on this read through, was at how well each piece fits together at the end. While the first three books really function as their own separate pieces, book four introduces some of the major plot elements that stretch through to the end. Pieces of the first book return to impact and flesh out the events of the last. It's a clever bit of retrocontinuity, or some incredible planning on Rowling's part, or a bit of both, but after taking a break from the books for the better part of three years, returning felt like putting a pair of fresh eyes on the story as one continuous unit, rather than taken in piecemeal over the seven or so years that I read the books as they came out. Where I was disappointed with The Deathly Hollows before, I was blown away by it this time around. While the book has its problems - the first half feels like filler, while the last half feels like an information dump - it accomplishes what some books have a very hard time doing: saying goodbye to a longstanding story and tying it up in a satisfactory way. The ending is happy, perfect, while major themes on good vs. evil, destiny vs. self-determination and friendship vs. enemies all play out around this. Young adult fiction has been a growing market for both youths and adults, and after reading through the seven books here, it's easy to see why: it's a perfect balance between entertainment and morals. While they seem to shuck some of the subtlety that I appreciate in some of the upper echelons of genre literature, these offer much the same end result.